The fashionable lunch bag. It’s a controversial matter— these glorified designer lunch bags sell for hundreds of dollars but the sack-like shape is nothing new. I’ve seen articles ridiculing the Jil Sander coated paper bags but more and more designer versions seem to be popping up. For me, the novelty is too good to pass up! Maybe I’ll use it as a clutch or maybe, I’ll actually use it as the chic-est lunch bag ever. Check out the steps below to see how I made one of my own. [ CUT BAG ] – Take your paper lunch bag and cut it open. This will be your pattern for your new bag, so pick one that is the right size for you! [ CUT LEATHER ] – Lay out the pattern over your leather. Cut the leather, leaving a quarter inch seam allowance around all the edges that you had cut open. You’ll need that seam allowance for when you sew the leather together. 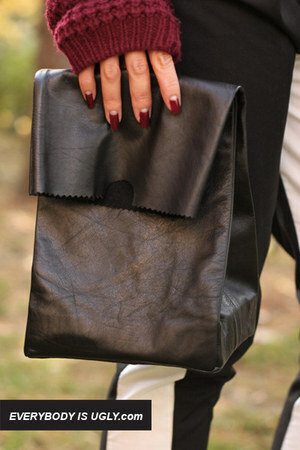 [ SEW ] – Sew the leather together exactly the way you cut the bag apart. You’ll have some excess parts in the corners, but you can just trim the interior corners to get rid of some of the bulk! [ CUT DETAILS ] – Use pinking shears and trim the top portion of the bag for the zig-zag effect. Cut a small half circle as well, to really make this an authentic paper bag. Thanks for reading! Are you gonna try this DIY? Tweet us a photo @everybodyisugly! Can this bag be purchased??? if you alter the pattern a little you can make a great clutch I tried it and it turned out great, with a few studs or jewels! Wow! I love this. Gotta try it! i'm def gonna try this. This loooks so cool, gonna try it when I can. Yeah it'd be a waste to just leave it to carrying your lunch hahaha Cute :)! I like your DIY better than the real thing! : ). Omg. Totes need to try this. I've been obsessing over the Jil Sander bags! AMAZING bag. I would've loved this during school. Also, you look great in the burgundy Sylvia!